Disputing this is the Royal Hua Hin Golf Course, which was the first 18 hole, International Standard Golf Course - commissioned in 1924. It was built to give the British Rail Workers a Pastime and it was designed by a Scottish Railroad Engineer, Mr. A. O. Robins. The "Fair Play" of Golf seems to be originated upon disputes. Golf in Thailand today includes some of the finest Golf Courses in South East Asia and it has become part of Thailand's Tourist industry, providing an estimated 8 Billion Baht in annual revenue from Golfing Holidays. Thailand has over 250 courses, from Pitch and Put to International Acclaimed Courses. Whether you are a beginner or a professional, Thailand has a vast array of Golf Courses to suit. Thanks to Thailand's all year round climate and the New International Suvarnabhumi Airport becoming an Asian hub; Golf in Thailand now attracts large numbers of Weekend Golfers from China, Japan, Korea and Singapore. This has promoted Tourism numbers in Phuket, Hua Hin, Bangkok, Koh Samui, Pattaya and Chiang Mai, with the result that Golfing Holidays was born in Thailand. With the lowering costs of travel and high standards of accommodation; the competitive high class Golf Courses, prices and quality are the driving force for Golf in Thailand. Golf is also a major pastime for the thousands of ex-pat communities who live and enjoy the game all year round. They are also the backbone and driving force behind an abundance of Amateur Golfing Societies who offer comradeship, discounts, competitions, transport, equipment hire and packages. All are welcome; you don't have to be an ex-pat to enjoy the benefits of a Society. On the professional side, the Professional Golfers Association (PGA) formed in 1916, accepted applications from 13 Asian countries - Thailand included - to join. In 1995 the Asian PGA Tour was originated. Thailand's own Khun Thongchai Jaidee is the most acclaimed on the Asian PGA Tour. With 13 wins and 3 Orders of Merit, he has won over 5 Million Dollars in Prize Money. He has won the European PGA 5 times and finished 13th in The Open Championship 2009. Khun Thongchai Jaidee is currently ranked number 48 of the Worlds PGA Rankings. Thailand's 2016 leg of the Asian PGA Tour was held at "Black Mountain Golf Course" in Hua Hin where Thailand's Khun Piya Swangarunporn was runner up to Australia's Scott Hend by one stroke. The Black Mountain Golf Course in Hua Hin is a remarkable golf course and without doubts one of Thailand's Premier Golf Courses. 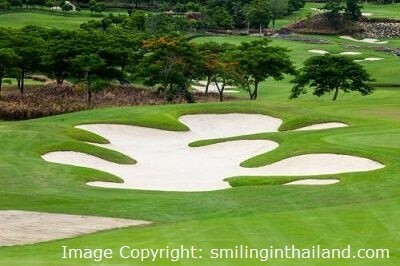 Other participated venues of the PGA Asian Tour are the Amata Spring Country Club, Alpine Golf and Sports Club and the Thai Country Club. The origins of the game of Golf can be vague, some historians can take it back to the Roman time, but the first documentation upon the game of golf came in 1457, where King James the 2nd of Scotland Banned the playing of the Game. His reasoning being, Golf was a waste of time and people should be practicing their Archery instead of hitting a ball aimlessly around the countryside. In 1502 King James the 4th of Scotland uplifted the ban on Golf and became a keen golfer himself and he had the first recorded Taylormade Golf Clubs. In 1574, St Andrews golf course was opened and is considered the Oldest Golf Course in History, challenging this is the Musselburgh Links, Scotland, with documented evidence dating to 1672, but, it is reputed the Queen Mary of Scotland played there in 1567, prior to the opening of St Andrews. The Guinness Book of Records has handed the title of the oldest Golf Course to the Musselburgh Links, I am sure this is still disputed throughout the Bars of Scotland and Golfing enthusiasts throughout the World. This is why the Game of Golf in its Modern Form is said to have originated in Scotland.